President Trump reiterated his government shutdown threat on Tuesday during televised negotiations with Democratic congressional leaders, saying he would not approve appropriations to keep certain agencies open past Dec. 21 if lawmakers do not agree to his requested funding level for a wall along the U.S.-Mexico border. 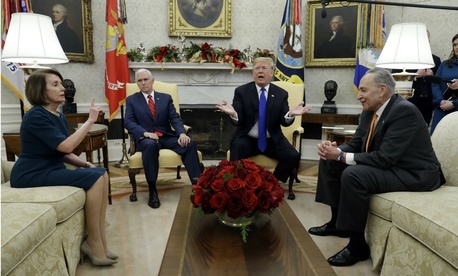 In a testy White House exchange, Trump goaded Senate Minority Leader Chuck Schumer, D-N.Y., and House Minority Leader Nancy Pelosi, D-Calif., who consistently pushed for the talks to take place in private. Trump made his position clear, saying he will “take the blame” if some federal agencies close. Trump began the conversation on a light-hearted note, saying the border wall negotiations would be the easiest item on the agenda of their Oval Office meeting. “It’s called funding the government, Mr. President,” Schumer responded. In his opening remarks, Trump initially said he would like to avoid a lapse in appropriations. The president signed a stopgap continuing resolution last week to keep the agencies that have yet to receive full-year appropriations from closing through Dec. 21. From there, the conversation spiraled into a chaotic shouting match, with Trump, Pelosi and Schumer frequently talking over each other to pass blame and state their talking points. Schumer pointed to Trump’s previous calls for a shutdown, saying the Democratic Party seeks to avoid an appropriations lapse at all costs. The Democratic leaders pushed Trump to take one of two paths forward: sign full-year appropriations bills for all agencies aside from the Homeland Security Department while providing DHS a one-year continuing resolution, or sign a year-long CR for all of the unfunded agencies. Both measures would include $1.6 billion for border security, the same total provided in the fiscal 2018 spending bill. Trump is asking for $5 billion for border security, including wall funding. Pelosi and Schumer emphasized that point when speaking to reporters outside the White House, saying the president wanted to let agencies close and a “Trump shutdown” could be avoided. Back at the Capitol Building, the House minority leader told reporters that Trump said off-camera he would consider the Democrats’ proposals. The departments of Transportation, Housing and Urban Development, State, Interior, Agriculture, Treasury, Commerce, Homeland Security and Justice, as well as other agencies, have yet to receive full-year appropriations for fiscal year 2019. Absent legislative action, around 300,000 federal workers will face furloughs in a partial government shutdown. House Republicans previously said they planned to consider all the remaining spending bills together under one package. Congress faced an easier road to passing spending bills after Trump earlier this year signed a two-year budget deal dramatically increasing spending caps for fiscal years 2018 and 2019. The funding measures already signed into law for fiscal 2019—which set full-year spending levels for the departments of Defense, Labor, Health and Human Services, Education, Energy and Veterans Affairs—account for 75 percent of annual discretionary spending, the highest percentage allocated on time in 22 years. Lawmakers have not yet raised spending caps instituted under the 2011 Budget Control Act for fiscal 2020, setting up another potential fight for the divided 116th Congress.